All Image is illustration only. The Final System designed may vary from the image shown. SECURITEX HEIGHT LIMIT DETECTION SYSTEM FOR USE ON HIGHWAY GANTRY. MOTORWAY GANTRY. VIADUCT. CARPARK. BRIDGES. OVERHEAD PEDESTRIAN CROSSING. PROTECTION. 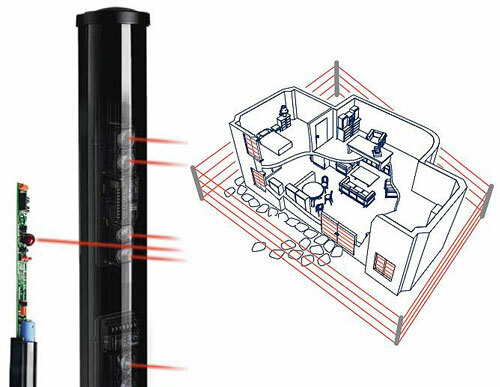 The Securitex IR beam Sensor Height Limit Detection Systems/ Safety Distance and Security Alert system is designed for use in premises where invisible fence Horizontal and Vertical Detection (HRD) is needed to preserved the aesthetic of the place yet provide safety and security in the premises against height limit and distance compromise. In some factory where the entrance and exit is a large opening and the client want to alert the security officer or drivers when there are object crossing or exceeding certain height or within a certain distance. Securitex system can be install on opening from 1m to 100m, our advance version can cover up to 500m per set for height limit and can go up to 100m above ground. Our super advance version c/w auto adjustable range. These Infrared beam sensor is suitable for both residential, commercial, construction site and industrial use. However, with a short-range beam, it is not suitable for protecting large yards or construction sites as you will need more than one beam to cover the area. A simple numerical control (NC) contact system allows the system to send a signal when the infrared beam is broken or cut. This signal is then cascade to the Securitex Beam Control Panel (SBCP) with local sound and visual alert. Our advance alert system can also be integrated to the building / facility / yard CCTV system, floodlight system and even the SMS alert system to be link to the 3rd party monitoring station. Outdoor all weather IP67 version and ATEX-Explosion-proof version can be use in very harsh environment like shipyard, oil refinery and oil, gas and chemical complex. Our system are designed using very high quality material thus ensuring that you can leave it outdoors for long period or use without maintenance. What is a IR beam Sensor Security Alert system? What is a Securitex IR beam Sensor Security Alert system some people may ask. Securitex alert system is sometime also call BEAM CUT BEAM INTERRUPTER (BCBT). which activate sound and visual light to alert the Security when some one intrude into a secured restricted area or BREACH HEIGHT LIMIT into a facility or construction site or rail network viaduct. Where are this system usually installed and deployed? This system are commonly install in area where constant alertness and monitoring of a certain perimeter and open area is needed. Can this system be install at Military. Power plant. Correctional Facility. Checkpoint. Boarders and Shipyard? Yes this system is specially designed and built for such facilities and additional tampering protection can be designed and built in them to ensure extreme reliability. Is Securitex IR beam Sensor Security Alert system Designed and Manufactured in house? Securitex Wireless & Intrusion Technologies Division, designed and built all type of intrusion and Height Limit alert system with material source from all over the world and only the best equipment is use to built the system and which we integrated to the local alarm system and for some very demand and highly secured area we even integrated them to 3G network SMS system etc. As this systems are designed and built in house, we are able to meet client all kind of request. What is the advantage of the 3G, 4G and even 5G IR beam Sensor Security Alert system compare to a standalone system. Our latest 3G/4G and 5G system delivers extra feature (Optional) that can allows the monitoring station to pin point the exact location of the trespass and intrusion and sent this alert signal over a very large area and even cross boarder and country. We are able to integrate the system to specially designed intrusion alert display panel and even 3rd party existing intrusion monitoring system. 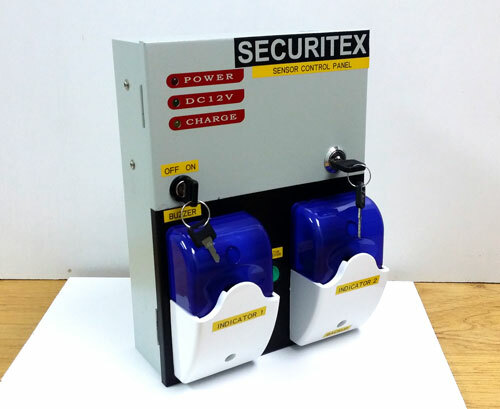 Do Securitex built Explosion Proof / ATEX or intrinsically safe Infrared beam Sensor Security Alert system? Yes we do such system with our overseas partners specializing the in the Explosion Proof sensors, these are usually made in Germany. Sweden, USA and United Kingdom and Italy etc. Can Securitex IR beam Sensor Security Alert system be integrated to our existing CCTV system? Yes Securitex IR beam Sensor Security Alert system can be integrated to client existing CCTV system when the system activated. Can Securitex IR beam Sensor Security Alert system be integrated to our Security Lock Down System? Yes Securitex IR beam Sensor Security Alert system can be integrated to client existing Security Lock Down Systems when activated. Can Securitex IR beam Sensor Security Alert system be integrated to Vessel, Oil tankers. Cruise Ship to detect pirates intrude on board? Yes Securitex IR beam Sensor Security Alert system can be integrated to the vessel security system when the perimeter or restricted area of the vessel or tankers are compromised. The system can turn on the floor light on the vessel deck and also to activate the vessel siren system. Perimeter Protection Using the Infrared beam. If you would like to order or for any inquiries, just send us an email sales@securitex.com.sg with your order information and system request. Securitex Electronic Systems Engineering can designed and built all kinds or intrusion Alert / Duress / Emergency / Lone worker / Dead Man Alarm & Man Down system etc control and announcement panel for use on monitoring of 1 user to hundreds of user. This Control Panel are usually install in Manned Control Room to monitor all the lone worker or user that may be in harm way in their cause of work. We are able to designed and custom made system that uses 3rd party Smart phone Apps install in their smart phones to communicate with this Control Panel. Securitex Electronic Systems Engineering. All Rights Reserves.